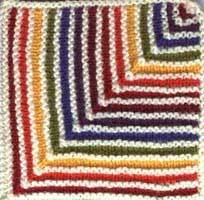 Note: This square must be knit with a yarn that can be ironed. Sl2, K1, PSSO = This is a double decrease knit thusly: insert your needle into the next 2 sts as if you were going to knit the two stitches together, slip them onto the right handle needle (instead of knitting them. Knit the next stitch. Pass the 2 slipped stitches over the knit stitch. Using white, cast on 61sts. Mark the centre stitch with a piece of coloured yarn. Cast on 30sts, pick up 1st at the bottom right hand edge of your first square. Pass the last 2 cast on sts over the first picked up stitch. Pick up a further 29sts. Knit 1 row. Continue following the square instructions from row 3. Pick up a total 61sts up the right hand side of your square, and across the top. Next row: Cast off, working a double decrease at the corner stitch. Iron and block according to the instructions on your yarn label.